The right books have the power to change your life...and bankroll. Check out the 17 top gambling books every serious player should read at least once and get ready to change your approach to gambling forever. The gambling world is awash with authors writing to offer advice and reveal some strategies to the reader. The titles included in our list of the 17 best gambling books of all time. Believe it or not, gambling books are the best way to survive the world of casino games. Whether you are a regular at the brick-and-mortar casino of your city or you prefer the online grind, you are not going to go far without the help of the right books on gambling. 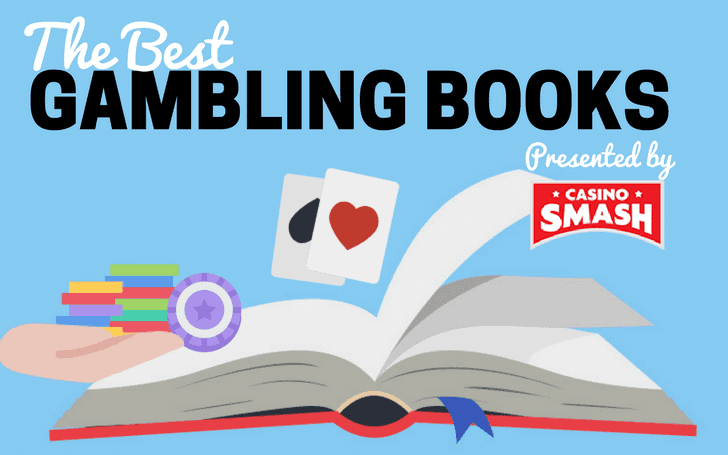 The seventeen gambling books featured in this list are a mix of fictional stories and strategy books carefully chosen by our editorial team to help you become that professional gambler you always wanted to be. 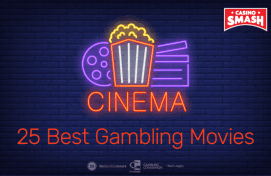 Check out the description of all the books on gambling featured in this list, read as many books as you can, and try to use what you learn in combination with the casino strategy articles you find published here on CasinoSmash. If your plan is to win big at table games or to become a professional gambler, you need to take this list of gambling books very seriously. Try to dedicate at least one hour to reading the advice shared by the authors, take notes, and use the easiest online casinos to apply the theory you just learned. Be careful: these seventeen gambling books will make your bankroll explode. This page is the beginning of a learning process that is going to change the way you live gambling and everything you knew about casino games. Be consistent, don’t be afraid to go back whenever a concept isn’t clear the first time you read it, and get ready to see your bankroll explode thanks to the tips you will find on these superb books on gambling. John Scarne (pronounced Scarney) was considered a gambling hero to the time of his death. In his era, his prowess was unparalleled - and being the pro that he was, he wrote an excellent treatise on the subject of gambling. This gambling book has it all, including the history and the rules of all the most popular casino games, some gambling math, and even some tips to cheat. It is a sort of an encyclopedia that any avid gambler would love to have. Also, the many anecdotal accounts of real and fictional events included in this gambling book make it a good and easy read, too. The book’s appearance is the first thing that will attract you. The glossy pages and the ample and colorful illustrations are what ever reader first notice when they get the book. Svoboda’s book about gambling is the kind of text that was openly written for amateurs, and as such it takes its sweet time to explain all the basics of each and every game. If you are looking for a starting point, for a gambling book that explains in simple words how to play and win at casino games, this book comes handy and covers all the bases. If you find high stakes poker thrilling, then this is the book to go for. The book is set in the glitz and glamor of Las Vegas and follows the unfolding of events around the highest stake poker game ever played. The game, which spans some years, had several of the best poker players in Vegas, including American billionaire Andrew Beal. The characters’ intrigues and huge bankrolls promise to keep the reader turning page after page. If you have ever wondered what goes through the mind of a gambler who places a minimum bet of $20K, then in this book lies the explanation. The author of this book is the director of the Center for Gaming Research at the University of Nevada. This just goes to give you a glimpse of the vast knowledge he has about the subject he chose to write about in his book on gambling. Roll the Bones dwells on the origins of the gambling paraphernalia that have shaped how the game is played. The book also shares some stories of some of the most famous card masters of their time such as France’s writer Voltaire, who in the 18th century figured out the trick to winning a lottery and as a reward took home 9 million francs. The ill fortune of Russia’s Dostoevsky who bankrupted himself at the in-house casino of the German resort town Baden-Baden is also told in beautiful vignettes. The aim of this book is to give the reader a rare and vivid depiction of the sports betting and gambling underworld. The memoir has moments that seem too good to be true as it takes us through different scenarios that are marred by fraud. All the characters that one would expect to find in a semi-fictional book about sports betting are found here. The author, who spent four years as a bookie, explains to us how things balance out when there is a professional who knows how to beat the house. If you bet on sports, you need this one. Renowned poet and literary critic Al Alvarez takes us on a first-class trip into the gambling world. Stories in this vivid depiction of the Las Vegas poker tables wind around over ambitious players who are ready to bet a whole suitcase of cash on a single roll of the dice, on the bad losers who never learn, and on those who just won’t accept that luck is not something they can get on their side. This is an immersing account into the sports betting operations in America. Given that Michael Konik is a journalist, it doesn’t come as a surprise that his book on sports betting uses tasteful writing to delve into the author’s own story of making millions wagering on sports and beating the bookies. Konik’s life takes a turn when he meets Rick Mathew, reputed as the best sports bettor in the world. The string of events that take place leads him to join The Brain Trust, a big money gambling group. This book gives you an interesting take on high-stakes sports betting and also some useful dos and don’ts to consider every time you bet on sports. Bob Dancer has had numerous successes in real-life video poker. The video poker master has penned down the ultimate how-to-win gambling book for all video poker enthusiasts to bury their heads in. The author of this gambling book attempts (successfully) to share strategies on all casino games within 19 chapters. The contents of the book are a result of a year of actual casino play combined with mathematical calculations and computer modelling. Gambling is a game that some believe relies on chance while others believe relies on math. If you are among those who believe in the power of calculations, to win a hand, then this is the book to go for. After reading about a professional gambler who gave it all up to play, Greg Elder decides to follow in his footsteps. Over the course of twelve months, Elder transitions from being a complete beginner to becoming a true pro gambler who can fend for his wife and daughter. This is the kind of gambling book to open your eyes as the riveting tale of a professional gambler is told in masterful fashion. Before the release of her book, Jean Scott was known to only a handful of pro players. After The Frugal Gambler went into publication, her name gained widespread popularity among casino players. This “Gambling Grandma” has since enjoyed the spotlight more than most television personalities. In her book about gambling, Scott reveals all the techniques that a low-roller can take advantage of to make the most of their betting stints. Scott boasts vast knowledge of the poker tables around the world, having enjoyed enormous success during her time. This is the long overdue sequel to Ian Andersen’s first book “Turning the Tables on Las Vegas.” Andersen seemed to have gone out of the radar after his first critically acclaimed gambling book. In this second edition, the author demonstrates how well he has perfected his strategy to win at blackjack. His approach teaches the mathematics, the psychology, and the physical well-being that one needs to emerge as a winner. The story revolves around the main character Richie V. Ritchie enjoys a short-lived but luxurious life of being comped by the casinos of Atlantic City. This fascinating gambling story is the kind that allows you to live vicariously as you move with the main character through different phases of his life as a high-rolling gambler. Blood Aces follows the story of Benny Binion as he rises to prominence as the originator of the World Series Poker (WSOP). The cowboy, gangster, and casino owner uses a combination of determination, vision and genius contrivance in all he does. His preferred way of doing things involved motivating the big boys, running a good business, killing his enemies, and owning the cops. Binion comes to dominate Vegas through skilful wit and cold-blooded business tactics. The story of a criminal who become a revered figure in gambling has never been told with such precision. A masterpiece written by a legend in blackjack, this book seeks to educate players looking to win serious money at this game. All the tricks that one needs to know on how to become a professional blackjack player are hidden in the pages of this book. Over the course of 21 chapters, all the tips on team play, pros-shuffle tracking, and multiple deck camouflage techniques as well as many other tricks are broken down in an easy to comprehend manner. In yet another guide book to becoming a pro blackjack player, Edward O. Thorp shares his expertise. What gives this book an edge is the fact that its author is a card counting pro with invaluable knowledge on the game. In Beat the Dealer, Thorp turns the tables on the house with his systematic explanation of the point system that has countlessly been used by players to win. The charts included in this gambling book is the most important think you will need to crush the game and learn how to win at blackjack. Finally. There are people who can gamble on anything and others who can stake crazy amount just because gambling is in their blood. All the outrageous escapades that sum up the typical casino life are told with expert attention to detail on this book about gambling. Being the gambling expert he is, Michael Konik delivers the message in intriguing fashion. Get all the latest CasinoSmash updates on your social media outlets. and find us on ! Ay Mamacita! Spain's Gambling Industry Generates Mucho Dinero! Receive an Extraordinary 400% Welcome Bonus: Join BGO Today!